Edens has a plan to expand its already large footprint at Union Market. 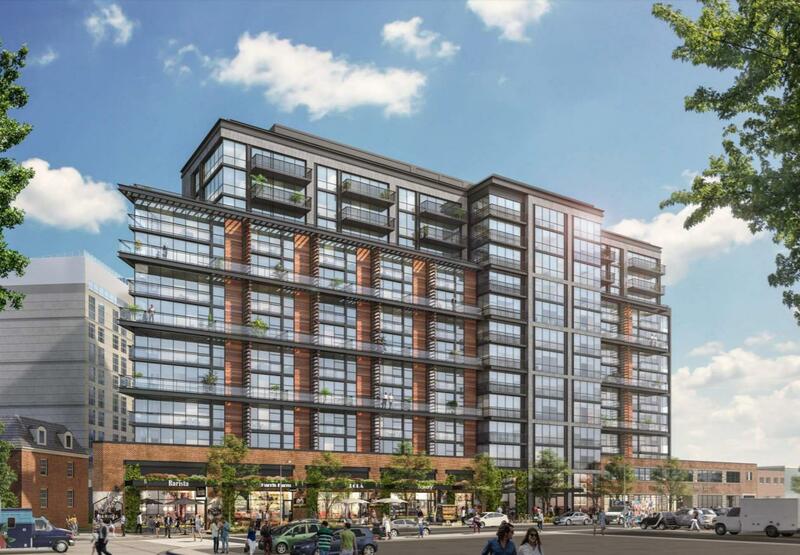 The developer is teaming with Boston-based UDR Inc. to build a 325-unit, 320,113-square-foot residential building at 500 Penn St. NE. The building will incorporate aspects of the current industrial building that’s been located at the site for 60 years. The team is working with architects from Eric Colbert & Associates on a 12-story triangular building that would contain a mix of layouts from studios to three bedrooms. Nine percent would be dedicated to affordable housing (up to 60 percent of the area median income). The building will have underground parking for 145 to 230 cars, as well as ground-floor retail. The property at Penn and Fourth streets NE was most recently the longtime home of the Maurice Electric Supply Co. The building was constructed in 1957 as a bottling plant for the Rock Creek Ginger Ale Bottling Co. Maurice Electric purchased the building as a distribution hub in 1987. Maurice was purchased by U.S. Electric in 2008, and most of its operations moved to Landover. South Carolina-based Edens purchased the current property for $20.7 million in 2014 as part of its massive buy-up in the area. Edens has spent upward of $80 million over the last decade, making it the largest property owner around Union Market. The current building is divided into a warehouse portion and a showroom. The developers plan to demolish the warehouse portion and retain the two-story facade of the showroom building, according to documents filed with D.C. Zoning. To that end, the new construction will capture the feeling of and complement the neighborhood’s industrial character, the zoning application said. That includes a retail base of brick, steel and concrete, “dramatic industrial canopies,” and a two-story masonry facade to balance the old Maurice facade. The proposed building is surrounded by new development in the Union Market Historic District. The renovated Union Market itself, also owned by Edens, is southeast of the property. An 11-story boutique hotel with arts space is planned just across the alley. Edens also owns the property next door, the repurposed warehouse that contains the Angelika Pop-Up movie theater, Dolcezza Gelato’s factory and additional retail. Edens plans 23,568 square feet of ground-floor retail at 500 Penn. The retail will occupy space on either side of the residential lobby, with the majority (17,751 square feet) on the west side. The usual amenities are planned, including recreational space and a roof deck with views of downtown D.C.